How much more truth can the Left stand to allow to be exposed? THIS is why Hillary lost! Even Democrat voter fraud couldn’t overcome the truth. Barack Hussein Obama, the racist Moslem that Democrats put in power as the leader of the free world, a position from which he acted as a Trojan Horse to bring down the West, is being exposed daily for the fraud and traitor that he is. The mainstream media, those who cover up his crimes and indoctrinates the ignorant, laments that the 10% of the media that is conservative exposes them because they no longer have a monopoly on reporting the facts. Only their empty-headed followers believe them when they say they report the facts while the Right just argues ideology. Only fools believe they are fighting fascism when they are embracing it. 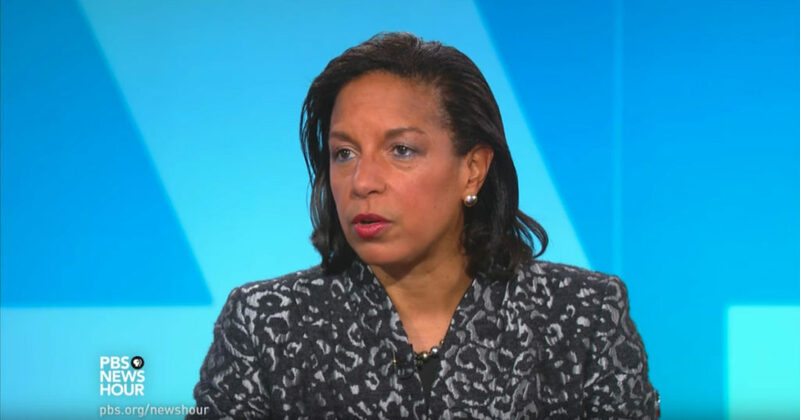 In 2012, Susan Rice went on TV to lay out the lie that America’s embassy in Libya was attacked by a mob of protesters disturbed by a video made about Muhammad. This lie was exposed, as was Obama’s lie that he called it terrorism the day it happened, but not until after they assisted him in winning re-election. America was duped for another four years of having a racist Moslem tear down her culture, her economy, and her military. Now in the space of a week she has been exposed as having lied for and with Obama about disarming Syria’s WMDs and forcing them to give up their poison gas weapons to Russia. The Russians, who supposedly worked with Obama the liar who promised to be flexible for Putin, but who now claims worked with Trump to corrupt the election of Hillary, are now working against Trump’s bombing of the Syrian airbase from which the attack was launched. Only the galactically stupid would believe a word coming out of the mouths of leftists at MSNBC and CNN that this could all be a smoke screen worked up by Trump and Putin to cover up stealing the election. More likely, their reports about the bombing are to cover up the revelation by Susan Rice that she confessed to ordering the unmasking of Americans in the Trump campaign like Gen. Flynn and leaked them to the press. This confession reveals that the Obama regime now admits they put the Trump team under surveillance making Nixon look like a piker. President Trump has an administration littered with Obama operatives seeking to undermine and sabotage his efforts to put forth his agenda. Thankfully, it seems that Republicans are getting more and more on board with working for him as Senate Majority Leader McConnell actually undid the Democrat’s filibuster to install Gorsuch on the Supreme Court. Their attempts to portray this as nuking the Senate rules fizzled when it was exposed that the rule was only emplaced in 2003 by Reid (D-NV) to hobble Bush and cast aside to give free reign to Obama. Amusingly, CNN was left with more egg on its face when they interviewed a Syrian refugee seeking a condemnation of Trump and instead sang his praises. As embarrassing as when they asked Egyptians rebelling against Mubarak to thank Obama, this man cursed Obama and declared he wants to go home. Contrary to leftist claims, most Moslems do not to come to America where Obama wants him sent, nor to stay in Germany or Sweden or France or anywhere in Europe where Islamists are causing hell. They want to live in their own country and make it great again. This is why I say all the time when I declare that most Moslems do not believe in Islam and would leave if they were not afraid of being murdered by the fanatics. Eighty percent say they want to impose Sharia Law on the world. What percentage would it truly be if they did not have a sword hanging over their necks when they answered? The Left lies about everything from their socialism being beneficial to Islam being peaceful to themselves not being fascists. Lying Democrat Mainstream Media gets Trumped again! Subscribe to iPatriot.com to see more of my articles. Stay informed! I am a retired paramedic/firefighter who served 25 years in the city of Dallas. I have degrees in Journalism, History, Military Science, and Military History that I spent most of the last forty years studying. I have also spent much of these forty years in scholarship studying Christianity, Islam, America, and world history. My writing is from the perspective of a conservative Christian libertarian and I use my free time in retirement to observe what is happening in politics. Much of what is in the news is propaganda that I have been trained and know how to recognize. My purpose is to expose the dysfunctional thinking of the Left and counter it with good sense conservative principles.